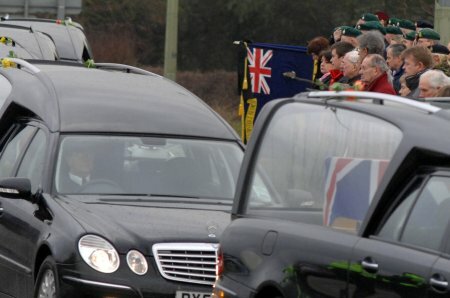 Crowds gathered on the A420 outside the Shrivenham Defence Academy today as a mark of respect for Lance Sergeant Dave Greenhalgh. The soldier was the latest casualty to be flown home and repatriated from Afghanistan. He died in an explosion while on vehicle patrol near Lashkar Gah in Helmand Province last Saturday. L/Sgt Greenhalgh's body, and those of four fellow soldiers, passed through Wootton Bassett before they travelled to the John Radcliffe hospital in Oxford.